News has said that students will be allowed to bring mobile phones and IT gadgets to school from next year after rules and regulations under the Education Act 1996 are amended. 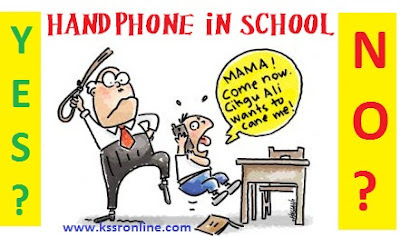 As some of us still remembered around year 2006 when initial reports about students being allowed to use handphones in schools were first released, many teachers were incredulous. There were already enough problems in schools where the ruling against handphones was strictly enforced. With the lifting of the ban, all hell was expected to break loose. But it was when the announcement to renew the handphone ban came shortly after that. Our Deputy Education Minister said the move was in line with the implementation of the virtual teaching and learning programme, dubbed “1Bestari” which offers free WiFi. “We want to provide a virtual learning environment so that students can use their gadgets to learn. “The world is totally different now. “This is a trend. We can't stop it,” he said after chairing the student discipline committee meeting here yesterday. After the announcement made yesterday, however, many parents have expressed their disagreement as they wish to communicate with their children after school. While teachers were generally opposed to the idea, some parents were still pleased. Parents agree to that as they need to keep in touch with their children. That is how their children will reach them in case of emergencies. Dr Wee has invited the public to give their views via the Education Ministry's official Twitter account @1KemPelajaran. He said the draft of the amendment would be submitted to the Attorney-General's Chambers within a week and that “stringent” guidelines on the use of electronic gadgets in school would be put in place. “The guidelines will spell out how and when the students can use the gadgets,” he said. Well, what do teachers or parents here think of the new move? Feel free to comment your thoughts here.